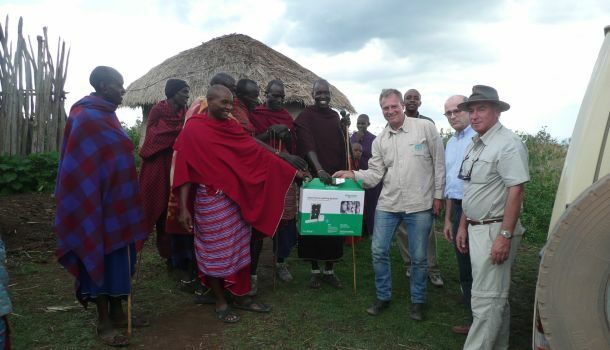 As part of the series of events taking place during the Open Door Days at KIITEC, a special journey to the Olmekeke Masai village was completed to deliver a solar panel kit for the local inhabitants. This gift provided light to the classrooms in the local primary school and a cell phone battery charger available to the villagers. 5 representatives from ADEI, FTE, Schneider Electric and Power Technics ventured through the Tanzanian wilderness to reach the remote village nearby Olduvai. ADEi Board Member Francis Brochon, an experienced safari guide; lead the group to their final destination with a minor detour to visit the incredible wildlife Tanzania is famous for. A very warm reception was given by the Masai community to the 5-member group. This one solar kit will provide many changes and new opportunities for this community. The Schneider Electric solar kit was comprised of a 10W solar panel, 2.5 Ah batteries and a 5W LED lamp. KIITEC students will travel to the region in the New Year to install the kit as part of a special education project and remain in contact to monitor any repairs or maintenance needed.